We all like to think of our beds as safe spaces, keeping us warm, relaxed and protected from the outside world. Unfortunately, this is not always the case, and our pillows see more than their fair share of outside invasions. Mites and bacteria thrive off warm environments, and those of us guilty of leaving our pillows slightly too long before washing are likely to experience the worst of it. Contamination from mites, bugs and bacteria can cause illness, skin issues and even respiratory problems – hardly conducive to a good night’s sleep! Why use a Pillow Protector? With so many irritants out there, our bedding needs all the help it can get. Dust mites, bed bugs, mold and mildew can all get in and around our pillows, unsurprisingly doing very little for our quality of sleep. Your knight in shining armour is the pillow protector – one of the best ways to prevent bacteria, germs and mites from seeping into your pillow while you sleep. Pillow protectors provide a protective layer against any nasty germs and mites, preventing them from getting into the filling and breeding, and they can even help protect against bed bugs. Much as we hate to admit it, our pillow sees all sorts of bodily fluids as well as a range of accidental spillages. That spilt coffee in the morning or perspiration from those extra-hot summer nights can create unwanted stains and blemishes on our pillows, potentially even dissolving the filling over time. A damp and warm environment provides perfect breeding conditions for mites and germs, meaning your pillow problems are only going to get worse! Protecting your pillow against moisture is even more important if you have a filling such as feather or down, which doesn’t mix well with moisture. Investing in a waterproof pillow protector will help extend the life of your pillow, keeping the filling dry, comfortable and cool while also warding off any other unwanted guests. With so many pillow protectors on the market, it can be difficult to know which one to go for. We’ve compiled a list of our top pillow protectors to help make that decision slightly easier! First up we’ve got the SureGuard pillow protector which comes in a pack of 2 and a choice of both size and material. Choose from either Cotton Terry or Smooth Cotton in either Standard, Queen, King, European or Body sizes. As a brand, SureGuard are reliable and generally produce good quality bedding. These protectors are bed-bug proof, waterproof and come with a 10-year quality guarantee for peace of mind. 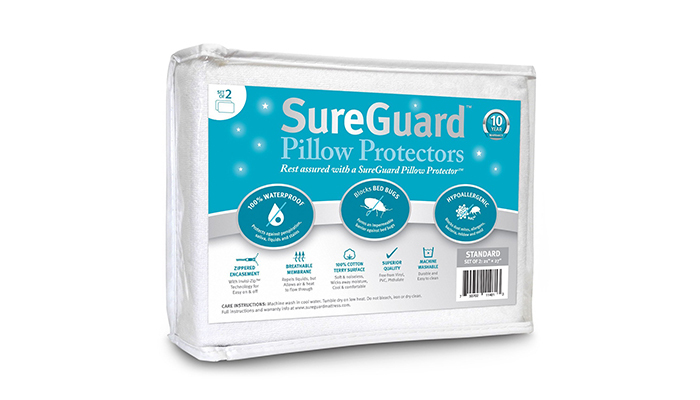 While you may pay slightly more than some of the others on this list, the SureGuard protector is a fantastic quality making the price, in our opinion, more than worth it. Both the cotton terry and smooth cotton are soft and noiseless, resistant to moisture and free from vinyl, PVC, phthalates and other toxic chemicals. This makes these protectors ideal for children, those with respiratory diseases and people with allergies. They also stay cool in the night and are easy to look after, both machine washable and dryable. The zipper on the side means the protector can be easily fitted and removed, while the range of sizes will fit virtually any pillow. While the SureGuard may cost slightly more, the price is pretty much bang on for the quality you receive. All in all, one of the best pillow protectors which ticks all the boxes. Next on the list is the Everlasting Comfort pillow protector also in a pack of two. 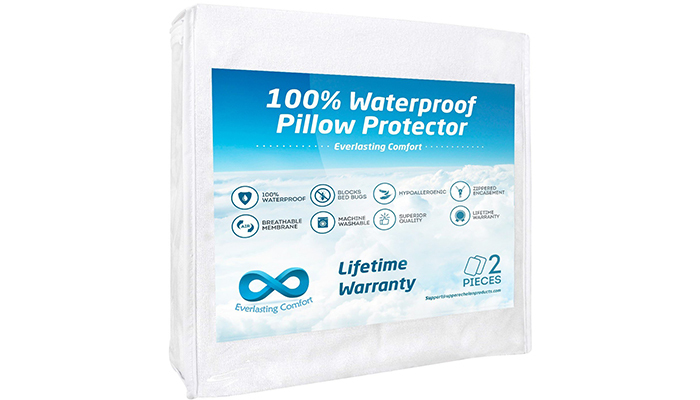 The Everlasting Comfort protector is hypoallergenic, waterproof and breathable, protecting your pillow from all bodily fluids, bed bugs, mites and other allergens. The material is also 100% cotton terry and the protector is comprised of two layers. The first is the soft, breathable, crunch-free cotton terry surface, and the second a protective membrane barrier which does most of the work. 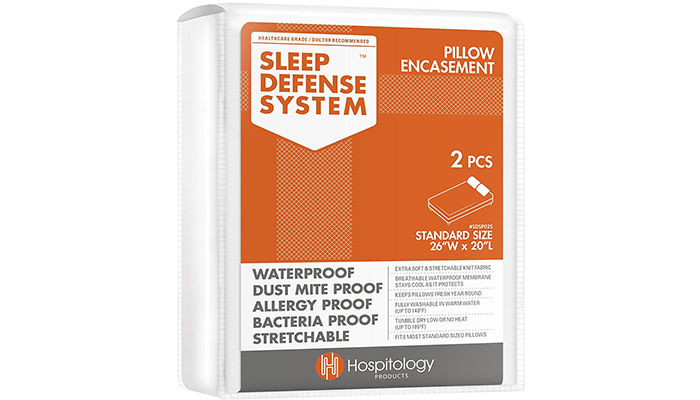 This barrier prevents mold, dust, pollen and other bacteria from penetrating the surface of the pillow and it’s also 100% waterproof, stopping the absorption of moisture into the filling of your pillow. Choose from Standard, Queen or King sizes of high-quality protector. Each one is machine washable and comes with a lifetime warranty. For a great quality and good value protector from a highly reputable brand, this Everlasting Comfort protector should be your go-to. Also in a set of two, the LUCID premium protector comes in a range of sizes, making it suitable for practically everyone. Choose from Standard, Queen or King. This protector is noiseless and comfortable, made from hypoallergenic cotton terry. 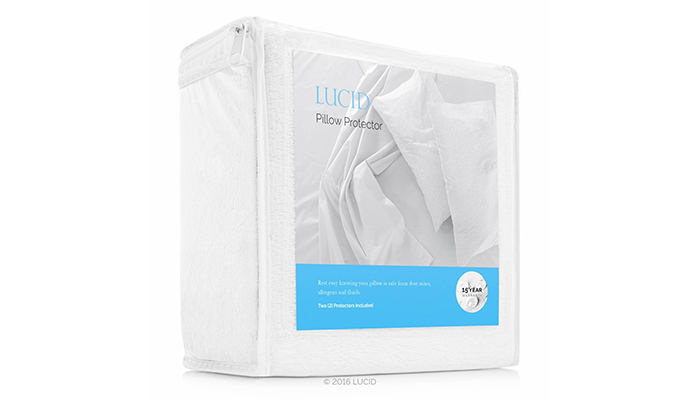 It’ll protect your pillow from dust mites and bacteria, as well as accidental spills and all bodily fluids. The protector is comprised of two parts, the cotton terry surface which ensures a soft and comfortable night’s sleep, and the Stratsomart barrier underneath. This ultra-thin barrier contains pores which allow air to pass through – helping you to stay cool during the night. This protector is also machine washable and safe to dry. 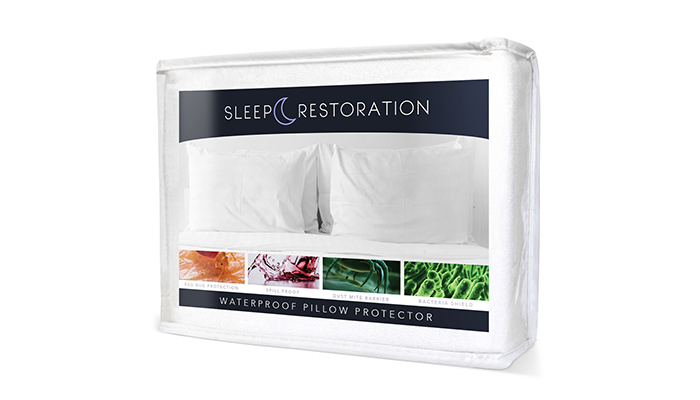 Next up is the Sleep Restoration 100% waterproof pillow protector. Also available in a Standard, Queen or King sizes, this pillow protector comes with a lifetime warranty and a 30-day satisfaction guarantee. It has a cotton terry surface and zipper closure, making it easy to wash and care for. The breathable membrane combined with the cotton terry material means air can easily pass through – preventing you from getting too hot in the night while also keeping moisture and bodily fluids away. The cover is hypoallergenic so ideal for people with allergies and will protect you from bed bugs, dust mites, mold, pollen and other allergens. The material is also non-crunchy, so a good night’s sleep is practically a given! Finally, we’ve got the Hospitology pillow encasement which is one of the most popular protectors on the market – and that’s not just because they refer to it as an ‘encasement’. Like the others on the list, this Hospitology protector comes in Standard, Queen or King, and is also comes with a 2-year manufacturer’s warranty. The material is 100& waterproof and virtually noiseless. There is no ‘crunching’ sound. It’s also high quality, made from an extra soft polyester knit fabric. The zipper on the side means the protector can easily be removed and cleaned, although it requires slightly more care than the others with the recommendation to spot wash or hand wash. All in all, a good protector at an even better price.